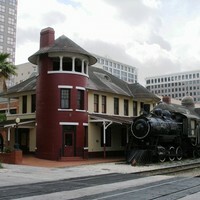 The Old Orlando Railroad Depot, located at 127 West Church Street in Orlando, Florida, in 2007. The station was first constructed in 1880 connecting Orlando to Sanford. After the railroad was bought up by the Plant System in 1883 from the South Florida Railroad, it was extended to Tampa. This brought a large boom to Orlando's economy shipping cattle and lumber, but chiefly citrus. By 1926, the depot was becoming too small for the volume of trade going through, so the depot was moved south to what is today the Amtrak Station. The depot became run down until the mid-1970s when Church Street Station opened up around the depot and stayed open until the early 2000s. Now the station is used as a stop along the SunRail Tram system. Original color photograph by John Bradley, April 21, 2007: Wikimedia Commons. Central Florida Railroad Depots Collection, RICHES of Central Florida. Originally created and owned by John Bradley. Permission is granted to copy, distribute and/or modify this document under the terms of the GNU Free Documentation License, Version 1.2 or any later version published by the Free Software Foundation with no Invariant Sections, no Front-Cover Texts, and no Back-Cover Texts. A copy of the license is included in the section entitled GNU Free Documentation License. Turner, Gregg M. A Short History of Florida Railroads. Charleston, SC: Arcadia Pub, 2003. Antequino, Stephanie Gaub, and Tana Mosier Porter. Lost Orlando. Charleston, S.C.: Arcadia Pub, 2012. "Downtown Orlando Historic District Walking Tour." City of Orlando. http://sanfordhistory.tripod.com/Links/wtour.pdf. "RICHES Podcast Documentaries, Episode 25: The Railways of Central Florida." RICHES of Central Florida. https://richesmi.cah.ucf.edu/omeka2/items/show/2477. Bradley, John. 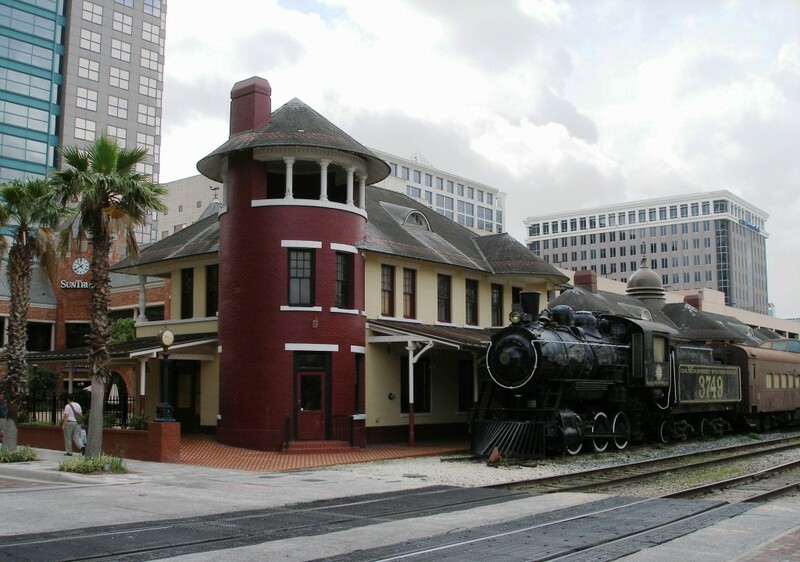 “Church Street Station, 2007.” RICHES of Central Florida accessed April 24, 2019, https://richesmi.cah.ucf.edu/omeka/items/show/5103.